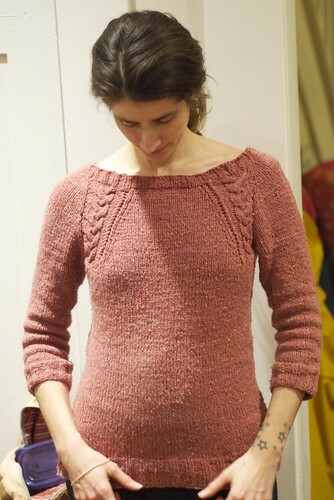 In no particular order, let’s start with Miss C in her Abate sweater. 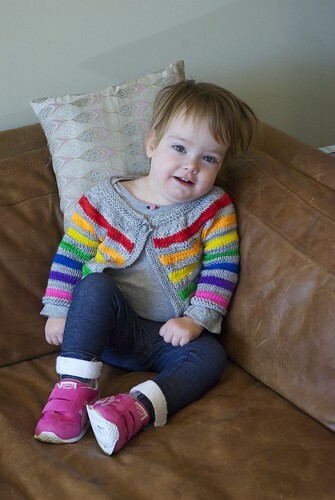 I made it in Rain City Knits Yarn, which is this fabulous neon coloured yarn. 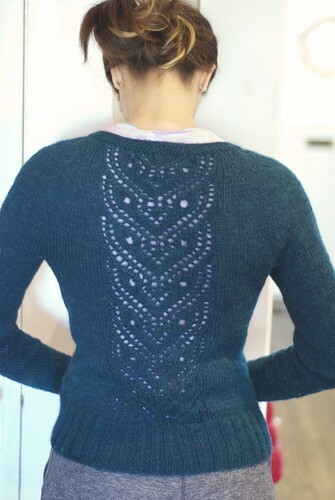 This particular one has been discontinued, though I still, happily, have another skein. The colour way, “Graffiti” (still available in other Rain City yarns, I think!) makes me think of candies and cupcakes. It was hard to get the colour right on that photo – the green tub and neon yarn seemed to confuse the white balance settings on my camera. I made this with B in mind, although they mostly share clothes. But B was not in a modelling mood. 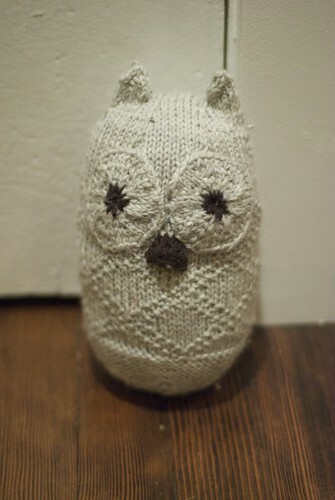 Next up, an Owl I knit for P, as owls are a bit of theme at P’s school. There was also a Bunny for M, but the photo was blurry, so we’ll save that for another time. Both were made in Cascade 220 and used less than a skein. 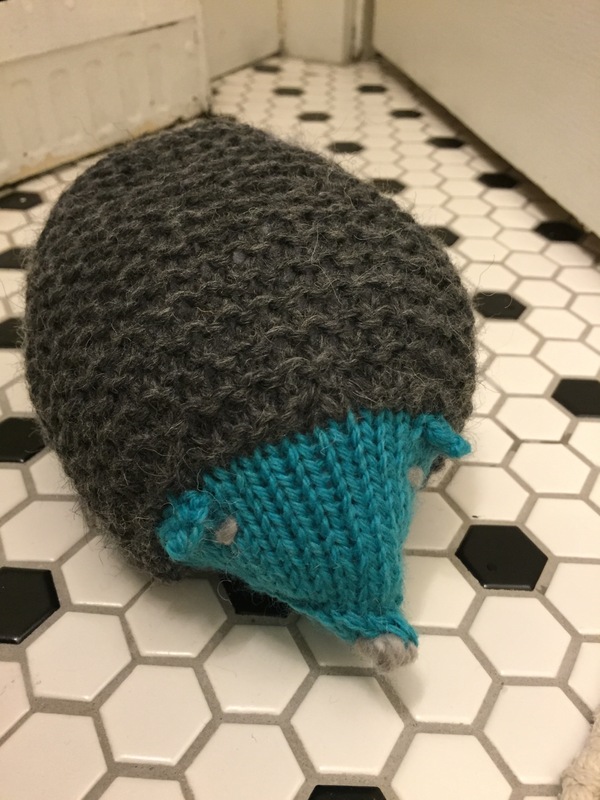 The patterns (free on Purl Soho’s site) were designed for bulky wool but they worked out nicely in a smaller weight. The Owl was made with leftovers from my Frosted Alpine Hat actually, which was yet to be properly photographed. Hopefully Miss M didn’t lose it before I could take a proper picture. And last, but not least, Coda! 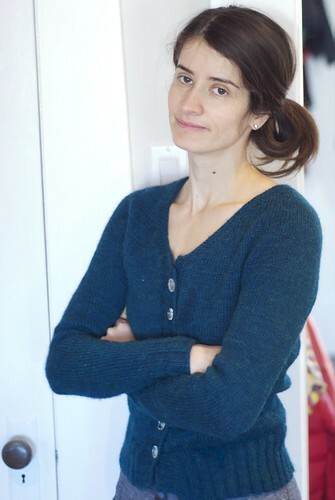 I finished this sweater before Christmas and have been wearing it quite a lot. Brooklyn Tweed seems a bit scratchy when you work with it, but I find it very soft and wearable next to the skin. I love this colour (Camper) too. Didn’t I just say I wouldn’t get caught up in a frenzy of last minute Christmas knitting?? Um, what happened? Then this owl. Just needs eyes. Destined to be rejected in favour of store bought goods but some day they’ll thank me. Coda is done! Sorry, no pictures yet, still blocking, but I tried it on unblocked and it felt great. I was a little worried about how it would all go together as the two pieces didn’t look like they fit quite perfectly, but with a little stretching and some locking stitch markers I pinned them and it worked. I’m not the best at mattress stitch, but it worked. I’ve been reading the Tanis blog a lot lately as I’ve frequently used her yarns – it’s one of my go-to worsteds. 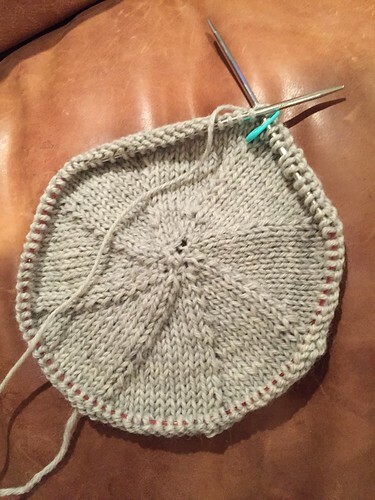 I got enamoured with a hat pattern she posted, and since Miss M requested a hat, I figured I’d give it a go. Ironically, I didn’t use Tanis Yarns this time – went for the workhorse Cascade 220. Hm, I love Brooklyn Tweed wool and stocked up at Knit City. I’m knitting myself a pink sweater and it makes me very happy. It was Knit City this weekend. 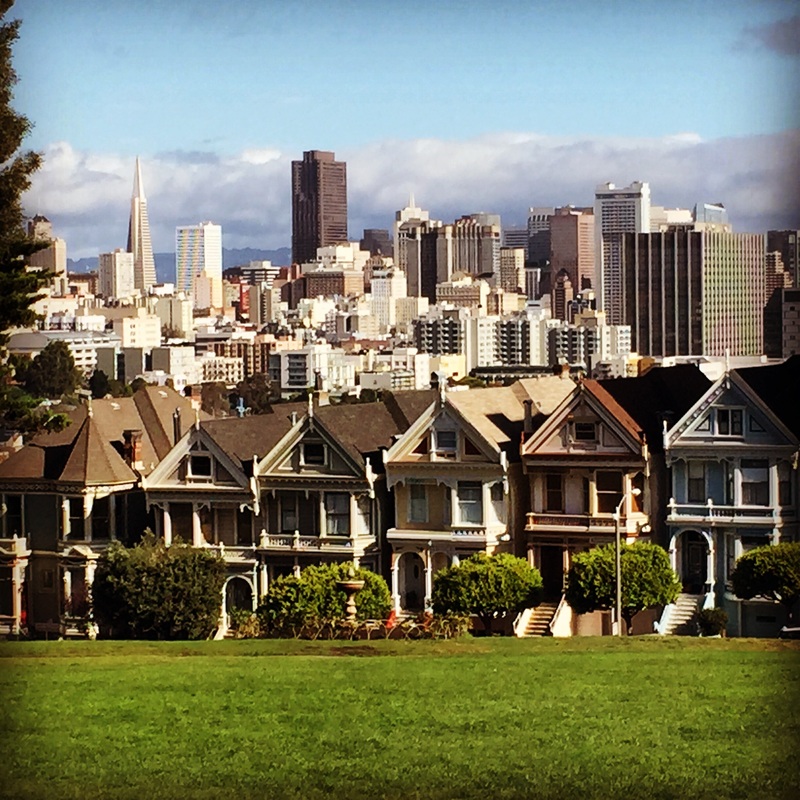 And wow, the weather was amazing. Sat outside in the sunshine eating a caramel crepe and feeling overheated in my sweater. And bought Brooklyn Tweed Yarn, which I can’t get here. I want to make their beautiful pattern Coda. 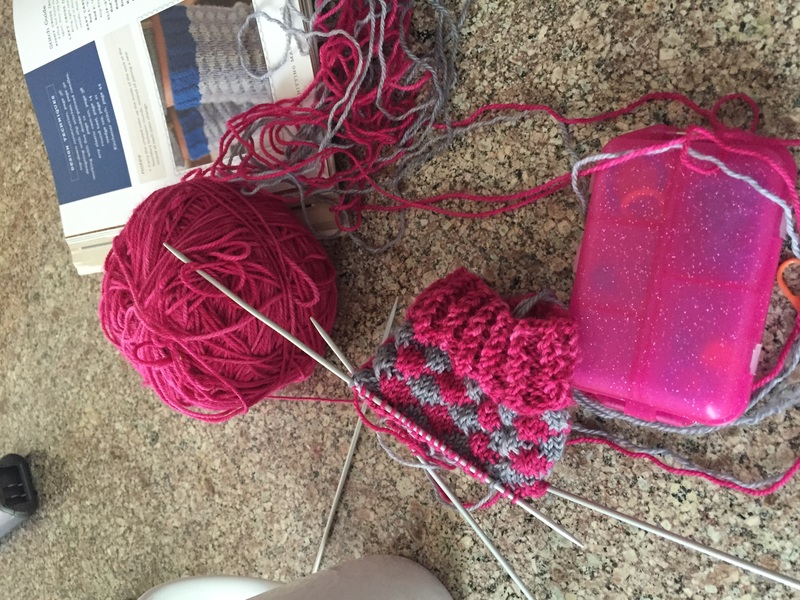 I also took a sock class with knit designer Kate Atherley and am working on a pair of custom socks. 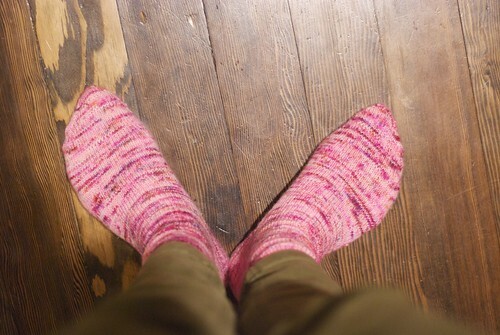 Remember when I planned to make 12 pairs of socks one year and then made, um, one? Well I’m not committing again. 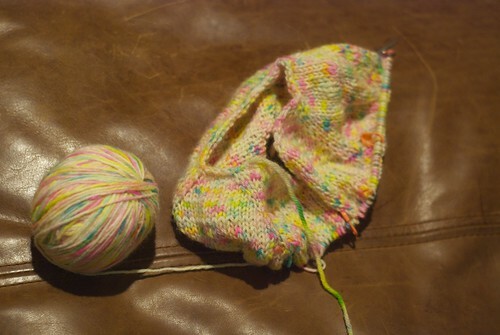 But I would like to get this pair done in October, and to knit more socks in general. My other favourite yarn is Rain City. The colours are amazing, and I couldn’t resist adding a little more to my stash, though I had PROMISED not to buy any more yarn on spec. But it’s so pretty. Yikes, sometimes I have so much to say I have to schedule posts and then a week or two goes by and nothing, nada, zip. We just got back from vacation, which was lovely. 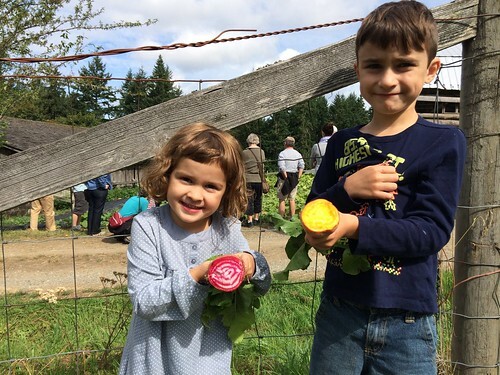 We stayed on a farm, in an old log homestead. 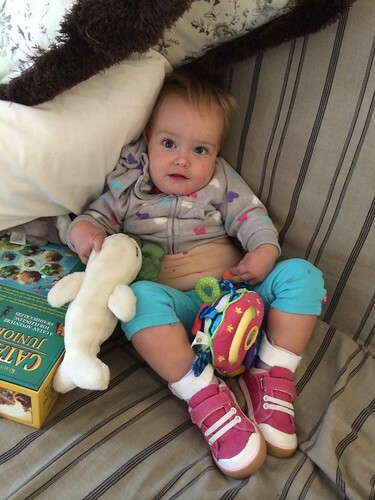 I was thankful again, that despite C’s CP, she has been very healthy. 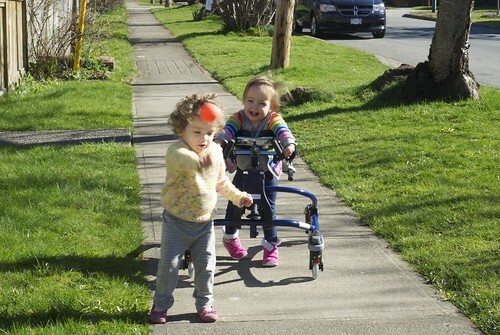 She got a fever on Day 6, and if she’d had a shunt, we’d have had to race to a hospital to make sure it wasn’t malfunctioning. Thank goodness, she seemed to just have a virus, and I just dealt with it the way we do with the others. But she was so sad and so much weaker. She couldn’t even tolerate holding her head up in her high chair. Thankfully she’s on the mend and she is back giving her patented Coco smiles. I knit a lot, but didn’t count on no web service, so I couldn’t access my Ravelry patterns. That means, I just did about 20 more Pop Blanket Squares, but I won’t bore you with pictures. Instead I’ll bore you pictures of the kids. I also read two books. 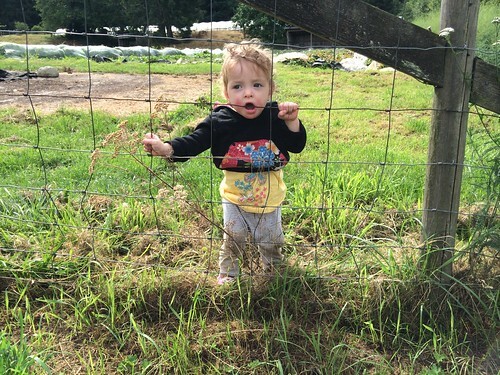 The first was Four Walls of My Freedom, by the mother of a now-adult child with CP. 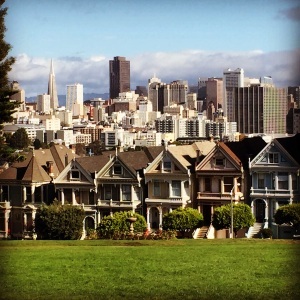 It was a good read – first just because it’s interesting to read the perspective of someone looking back on the early years. With the benefit of hindsight, she questions whether all the more intense therapies or medical treatment was worth it in the long run. The balance between “fixing” and “accepting” is a constant moral dilemma I have. It’s sobering too, as she explains some of the trials they’ve gone through, such as when she thought the doctors were finally understanding the pain her child was in, and instead she was investigated for giving her child too much pain killers. It’s more than a memoir though, as she makes some interesting arguments about the way we value people with disabilities, offering a sort of a primer on some of the philosophical thinking in this area. 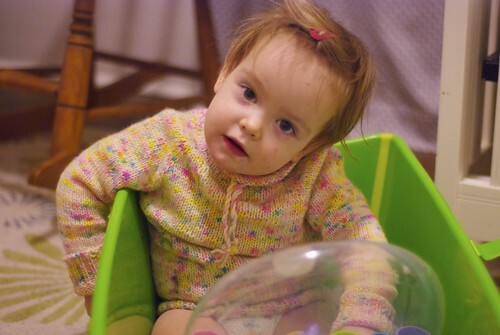 She discusses controversial figures like Peter Singer, who has argued that infanticide may be warranted in the case of children born with severe disabilities. The prejudice and stigma faced by people with disabilities is very real – perhaps one of the last areas in which it is socially acceptable to make that kind of argument. She proposes a very different approach, based on the thinking of Amartya Sen, which values experiences and relationships as measures of well-being. She works with someone to develop an index of well-being that applies to her family. I fell in love with this yarn at Knit City last year, and with another Knit City pending, I realized I better work my way through what I bought last year! I just love the crazy neons and how you can get a single stitch in one colour. It kind of reminds me of the crazy variegated acrylics you can get, but this is hand-painted loveliness. I hate knitting with acrylic, so this is as close as I’d ever get. 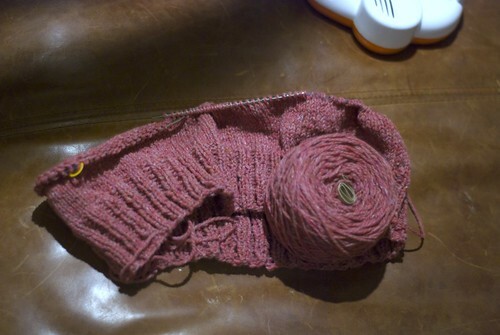 I started to knit a Purl Soho placket sweater. 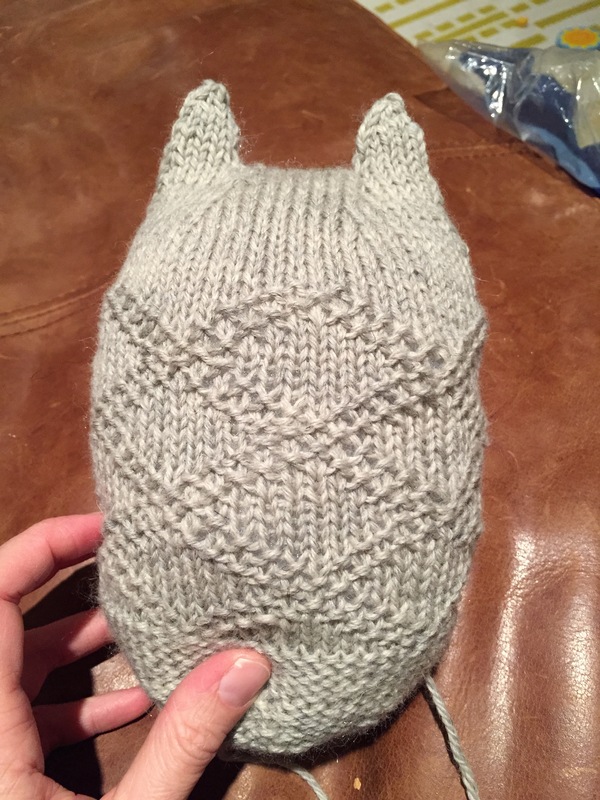 (Must add that I’m not convinced the pictures currently featured on Ravelry do it justice – it’s a very cute pattern and when I made it, the collar didn’t flare) But I had been a bit too casual about swatching it, and it turned out much larger than expected. Miss M announced she did not want another sweater, so I tore it out to make it for some more willing creature. The yarn, a Blue Leicester DK, knits up more like a worsted. I inadvertently blocked part of it by leaving it under the sprinkler, so I can confirm it puffs up nicely too. Anyway, I chose a worsted pattern instead, Abate, which has been in my favourites for ages. I bought three skeins so I am hoping I have enough left over to make some socks or a hat for ME. Okay, this is a bit of a cheat, because I knit this months ago when I was on maternity leave, but I finally got around to sewing buttons on, and I don’t think I ever posted it, so here you go! 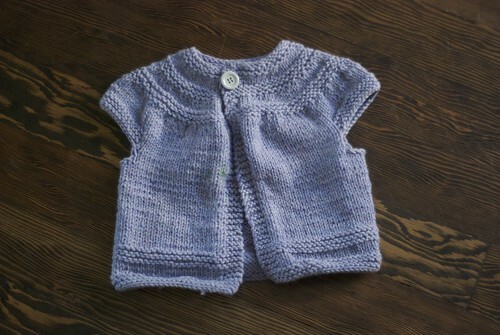 A sweet little short-sleeved cardigan. This was a super easy knit, basically made because I wanted to use up some Cascade I had kicking around from my aborted attempt at a blanket. But it’s a practical little item, and I think it would even fit Miss M as a little shrug over a dress. Oh, and without sleeves it knits up so quickly!